Okay, it’s a new discounted app under Amazon’s Kindle App Weekly Deal promo! 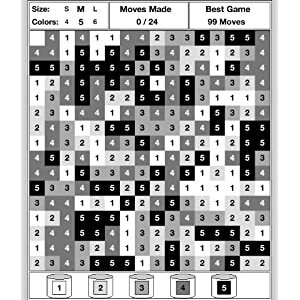 ‘Wipe Out (A Puzzle Game for Kindle)‘ by Applications Innovations is available on the Amazon Kindle site for $0.99 only through Thursday, 4/5. Just click here to download! Wipe Out is a puzzle game that requires a strategic mind to solve the puzzles in the fewest moves possible. Each game consists of a grid of squares made up of different colors (shades). Your goal is to flood the board with a single color within the allowed steps. To do this, you will need to select colors that will allow your control area to expand by engulfing adjacent squares that match the colors selected. The order in which you chose your colors will be the deciding factor in whether you complete the puzzle in the allowed steps. The game comes with three different grid sizes and the option to choose to play with four, five, or six different colors. The more colors you have available; the harder the puzzle will be. If you enjoy simple, quick, and fun puzzles, you’ll have a blast playing Wipe Out. Twitter Deal Alert! Barnes & Noble 16GB Nook Tablet (Refurbished) is $199 at Overstock.Com! FREE Amazon $2 Credit for MP3 Music Downloads!